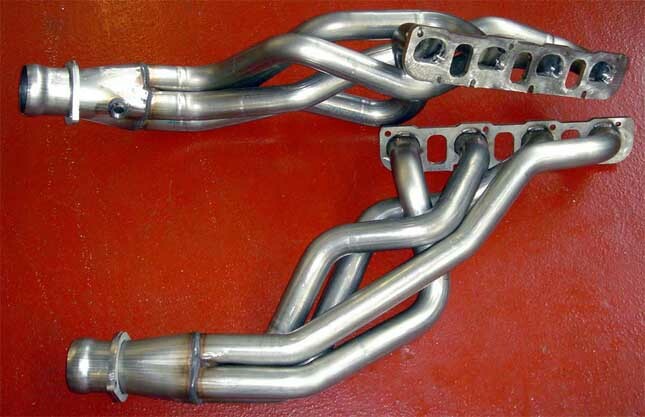 Exhaust headers play an important roll in a performance car. Exhaust headers bolt to the cylinder head and direct exhaust gasses immediately leaving the combustion chamber from the engine to the collector and eventually the exhaust pipe. Factory exhaust manifolds are not created to maximize performance or offer an attractive sound. Cost reduction and ease of manufacture both take precedence in mass production. These compromises made to please the average consumer greatly reduce the power felt by the automotive enthusiast who seeks more horsepower, torque, and sound. Unlike most factory log exhaust manifolds Kooks headers flow individually from each cylinders exhaust port before merging at the collector. Headers take exhaust flow and performance to the next level beyond just a catback exhaust system. Many factors must be taken into consideration when designing exhaust headers: pipe diameter, length of primaries, stepped or non-stepped design, and collector style, all while needing to fit within the confines of the crowded engine bay. After market exhaust headers can have a huge impact not only on power and sound, but the power band as well. Most Kooks headers are available with several different tube and collector diameters depending on your power goals and driving style. Kooks headers take your exhaust system to the next level and will provide more horsepower and torque because of with their increased flow.